Costa Rica is a country with many places to discover and so many activities to do. It is amazing to see the great variety of experiences this small country has to offer. 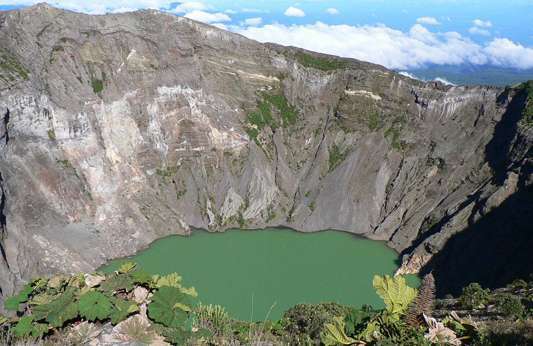 One activity you should take while in San Jose is the Irazu Volcano tour. Located in Cartago province this tour combines three different attractions: the first stop is the Irazu Volcano, which is 11.000 feet over sea level and it is the highest point on the Central Volcanic Mountain Range. The road goes through hills and you will discover this agricultural region, where potatoes, cabbages, and other vegetables are grown. Then, you will be able to visit Cartago, the old capital city of Costa Rica and Basilica de Los Angeles, home place of Virgin of our Lady of Los Angeles, Patroness of Costa Rica. After this visit continue the tour to Orosi Valley, where you will see the oldest Catholic church in Costa Rica (1743). In this cozy and nice church you will experience the presence of our Spanish predecessors and their strong religion beliefs. This excursion includes entrance fees, lunch, tour guide and transportation, everything you need to enjoy this full day tour. Don’t forget: jacket or sweater, sunglasses, camera, walking shoes and during rainy season, a rain gear. This adventure activity is a great chance to do the Sky Tram, a walking tour and the Sky Trek in just one tour. The aerial tram is ideal for people of all ages and visitors can appreciate excellent views of Arenal Volcano and Arenal Lake. The tram is a guided tour and takes about 20 minutes to reach the observation platform at the highest point. Then continue with a 25 minute walk in the rain forest to admire the beauties of this forest. To descend from the platform, it can be done either on the aerial tram or on the Sky Trek canopy tour. This canopy tour begins ascending by Sky Tram, then continues with a one and only experience of adventure and adrenaline at the zip lines that provides more scenic views of the rainforest. All these activities are offered with total security. If you are looking for beautiful views combined with adventure, this is the tour for you while visiting Arenal region. This tour is specially designed for adventurous people and bird watchers. This activity takes place on the Tarcoles River, home of one of the country’s largest crocodile populations and you could have the chance to see crocodiles up to the fifteen feet long. In addition to the crocodiles you may also observe many different species of birds in their natural environment.